Looking for custom made knitted products and supplies at a great price, look no further than Glen Valley Custom Knits! Located in the lovely town of Cornwall, Prince Edward Island, Glen Valley Custom Knits is owned and operated by Edith Scott. Prior to forming her own business, Edith had been interested in Knitting from a very young age (5 years old). Knitting garments for herself, family and friends, she then got into Custom Knitting. 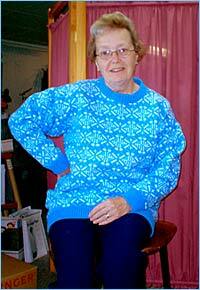 Edith has been an avid machine knitter for more than 45 years. In business since 1989, Glen Valley Custom Knits is your Maritime Distributor for Bramwell and Forsell coned yarns, and a Dealer of both new and used Knitting machines. Glen Valley Custom Knits is proud to play host to the P.E.I. Knitters Club meetings, which take place every month. This gives machine knitters from across the Island a opportunity to gather and exchange hints & tips, take part in knitting demonstrations, and bring creations for the Show & Tell. Glen Valley Knits also conducts hands-on workshops in the Spring and Fall. Give us a call today for any of your knitting supplies and questions. We look forward in talking with you!